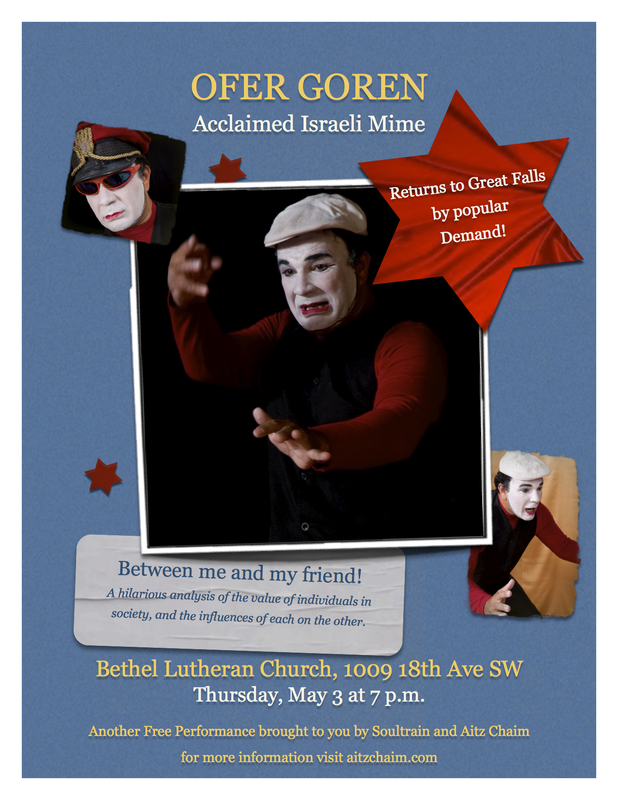 Mark Your Calendar for Ofer Goren’s Performance in Great Falls on May 3 at the Bethel! On May 3rd Ofer Goren is coming to great falls to put a free program on for us! Ofer Goren is a professional Israeli Mime. He does single person mime shows. They involve situation comedies based on stories from the Bible and on everyday life. The last time we had him in great falls was in 2010. I wasn’t sure what to expect, but he was hilarious! He doesn’t speak very much English, basically none at all, but he understands it fairly well and he has no problem communicating back by pantomiming! His program is largely audience participation, and calls on the audience to help him with his acts. The really fun thing is, you get exactly what he is doing and then “mime” along! I really hope to see many, many people there this performance. He is always a lot of fun. He will be performing at the Bethel at 7PM. Hope to see you there! P.S. Due to an unexpected house guest, I will be unable to house him for the night and need another host. Does anyone else have a room available that night? He is an extremely gracious guest. Posted on April 13, 2012, in Events, May 2012, Ram's Horn and tagged audience participation, comedy, entertainment, Israel, Mime, Mime artist, Ofer Goren, situation comedies. Bookmark the permalink. Leave a comment.